Delfts Blauw wedding cake, a photo by CAKE Amsterdam - Cakes by ZOBOT on Flickr. 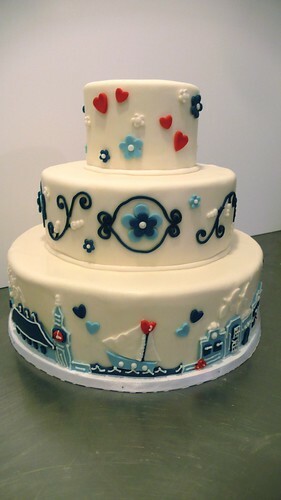 Delfts Blauw Dutch themed wedding cake with Amsterdam & London represented on the bottom tier! The couple even got married in a windmill! On a BEAUTIFUL & SUNNY 5th of November! this is sweet and vintage Dutch looking! it's lovely!